Baselworld 2017: A Brilliant Achievement from Glashütte | Tutima Glashütte/Sa. Baselworld 2017: A Brilliant Achievement from Glashütte - Tutima Glashütte/Sa. Tutima celebrates its ninetieth anniversary with the debut of the Tutima Tempostopp encasing new Calibre T659, which is made by Tutima in Glashütte. Following the sensational 2011 premiere of the HOMMAGE, the first German wristwatch calibre with minute repeater, Tutima continued to work toward transforming horological visions into ticking realities. 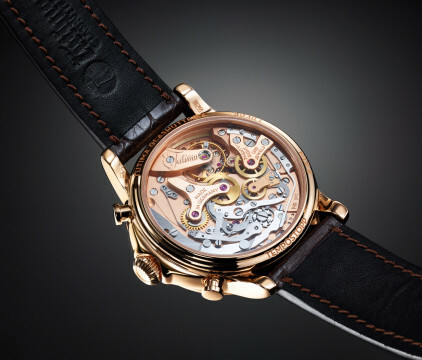 After the successful construction of the Tutima Patria in gold, a three-handed model encasing the HOMMAGE’s basic caliber, this family business now celebrates its ninetieth anniversary with the premiere of Calibre T659, another movement which was developed entirely by the Glashütte-based manufactory. Three years in the making, this latest masterpiece from Tutima revives a grand tradition. Tutima’s new Caliber T659 is a reminiscence of the Glashütte UROFA Calibre 59 from the 1940s, which was developed for the historic Tutima Fliegerchronograph and which made that watch into the first German chronograph with Tempostopp and additive stopping. The legendary pilot’s watch came to epitomize sturdy robustness, reliability and precision. Now this success story continues at Tutima’s original location with the debut of Calibre T659. Uniting the latest technologies and the virtues of the watchmaker’s art as traditionally practiced in Glashütte, all 236 parts of this exquisite movement are specially engineered, fabricated and finished on Tutima’s premises. Thanks to the complex additional flyback function, which was known by its German name “Tempostopp” when it first debuted in the 1940s, the chronograph’s elapsed-seconds hand can be started, stopped, and returned to zero with only one push of a button. This lets the user measure immediately successive intervals and makes numerous repetitive commands superfluous. A highly complex interplay of diverse mechanisms: Tutima Calibre T659 is one of very few “made in Glashütte” chronograph calibres. 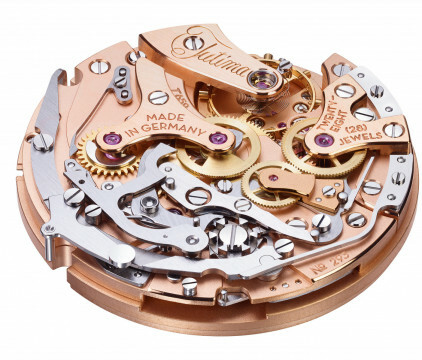 This calibre was developed by Tutima and superlatively unites experience, patience and precise handcraftsmanship. The appeal of the Tutima Tempostopp (ref. 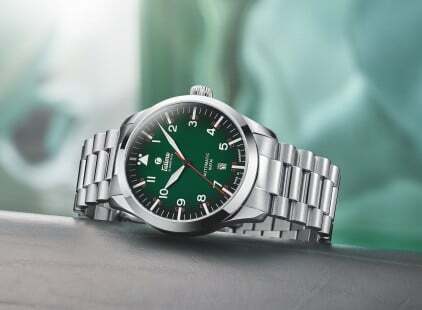 6650-01) derives from its timeless elegance and artisanally consummate manufacture technology. Chronograph Calibre T659 with flyback function ticks inside this watch’s case. This model’s name refers to the horological challenge that has been mastered and to the quality promise that has been upheld by consummate manufactory technology “made in Germany”. The 18 karat rose gold case contains Tutima Calibre T659, which animates a new wristwatch that is aptly called the “Tutima Tempostopp” and that perfectly unites beauty and enduring value. The fine case and dial recall the elegant understatement, classical elegance and artisanal artistry of time-honoured Glashütte watchmaking. The exterior is so deceptively sleek that it takes a connoisseur to intuit the presence of unconventional technology inside the watch. The new Tutima Tempostopp proudly carries the legendary chronographic art into the future and embodies another golden achievement at the brand’s renowned original location. Glashütte’s horological artistry under glass: from its development to its finishing, this 236-component calibre demanded the utmost from the watchmakers.